If you’re a publisher and you haven’t yet decided to incorporate native advertising into your monetization strategy, you’re missing out! First off, what is a native ad? According to the Native Advertising Institute, native advertising is paid advertising where the ad matches the form, feel and function of the content of the media on which it appears. Our full stack offer includes a native solution and enables publishers to maximize their revenue through all sales channels, programmatic or direct, while providing non-intrusive advertising experiences on any device. So, why are native ads a good idea for publishers? Native is the one format, if not the only format, that has grown 600% in 3 years! 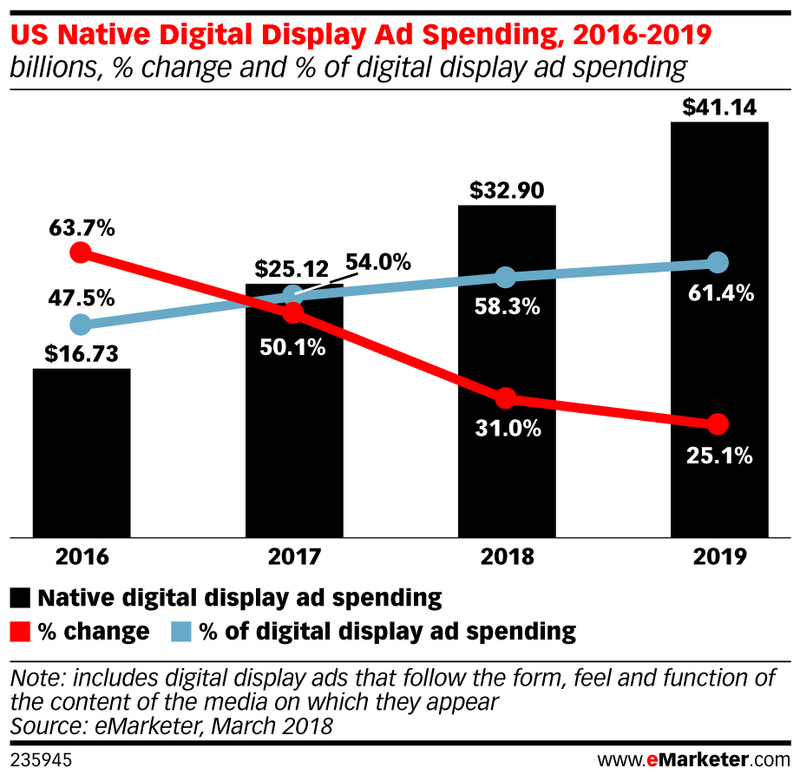 In 2019, 61.4% of US digital display spending will be for native placements. That’s up from 47.5% in 2016. The idea is rather simple: People see banner ads, but they actually read native ads. Bear in mind that today’s internet users easily detect and successfully avoid promotional content. As native ads slip seamlessly into content, users are more receptive to them. That’s why this format has been such a success. In fact, a consumer pays 308x more attention to a native ad headline than a banner ad image. + Native ads give twice as much visual focus and an 18% higher lift in purchase intent. + Native display ads CTRs are 8.8x higher than the average display ad. + On average, native ads CPMs for Smart’s top 10 publishers are over 2x that of classic banner ads. 3 – Native ads are easy to set up! Certain sell-side platforms offer solutions that allow publishers to set up native ads inventory on existing banner placements. These “native ads templates” eliminate the need for an additional technical setup and make it easy for publishers to diversify their monetization strategy, taking advantage of all native ads have to offer. Want to see how it works? Check out our Easy Native Templates. Publishers who want to quickly create native ads experiences that blend into their site should turn towards native ad builders. These advanced tools allow publishers to play with the look and feel of an ad so that it fits in seamlessly into their content. After customizing the ad position, size, color, and font, the CSS source code needed for the insertion is generated on the spot. Take a look at our Native Ad Builder to get the idea. Smart holds 6 billion native auctions per month and connects publishers to top global demand partners including DBM, AppNexus, Adysseum (Quantum), RadiumOne, Sociomantic, ZeBestOf. Our offer provides a non-intrusive, customizable and responsive native ads solution that offers elevated lift for brand affinity and purchase intent responses.